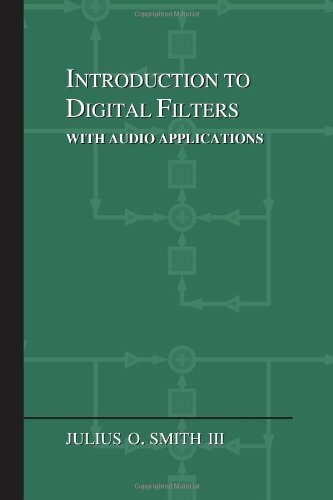 This chapter introduces analysis of digital filters applied to a very simple example filter. 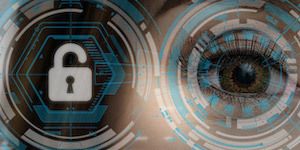 The initial treatment uses only high-school level math (trigonometry), followed by an easier but more advanced approach using complex variables. Several important topics in digital signal processing are introduced in an extremely simple setting, and motivation is given for the study of further topics such as complex variables and Fourier analysis . Musicians have been using filters for thousands of years to shape the sounds of their art in various ways. For example, the evolution of the physical dimensions of the violin constitutes an evolution in filter design. The choice of wood, the shape of the cutouts, the geometry of the bridge, and everything that affects resonance all have a bearing on how the violin body filters the signal induced at the bridge by the vibrating strings. Once a sound is airborne there is yet more filtering performed by the listening environment, by the pinnae of the ear, and by idiosyncrasies of the hearing process. A digital filter is just a filter that operates on digital signals, such as sound represented inside a computer. It is a computation which takes one sequence of numbers (the input signal) and produces a new sequence of numbers (the filtered output signal). The filters mentioned in the previous paragraph are not digital only because they operate on signals that are not digital. It is important to realize that a digital filter can do anything that a real-world filter can do. That is, all the filters alluded to above can be simulated to an arbitrary degree of precision digitally. Thus, a digital filter is only a formula for going from one digital signal to another. It may exist as an equation on paper, as a small loop in a computer subroutine, or as a handful of integrated circuit chips properly interconnected. Computer musicians nearly always use digital filters in every piece of music they create. Without digital reverberation, for example, it is difficult to get rich, full-bodied sound from the computer. However, reverberation is only a surface scratch on the capabilities of digital filters. A digital filter can arbitrarily shape the spectrum of a sound. Yet very few musicians are prepared to design the filter they need, even when they know exactly what they want in the way of a spectral modification. A goal of this book is to assist sound designers by listing the concepts and tools necessary for doing custom filter designs. There is plenty of software available for designing digital filters [10,8,22]. In light of this available code, it is plausible to imagine that only basic programming skills are required to use digital filters. This is perhaps true for simple applications, but knowledge of how digital filters work will help at every phase of using such software. Also, you must understand a program before you can modify it or extract pieces of it. Even in standard applications, effective use of a filter design program requires an understanding of the design parameters, which in turn requires some understanding of filter theory. Perhaps most important for composers who design their own sounds, a vast range of imaginative filtering possibilities is available to those who understand how filters affect sounds. In my practical experience, intimate knowledge of filter theory has proved to be a very valuable tool in the design of musical instruments. Typically, a simple yet unusual filter is needed rather than one of the classical designs obtainable using published software. Let's start with a very basic example of the generic problem at hand: understanding the effect of a digital filter on the spectrum of a digital signal. The purpose of this example is to provide motivation for the general theory discussed in later chapters. Figure 1.1: Amplitude response (gain versus frequency) specification for the ideal low-pass filter. Our example is the simplest possible low-pass filter. A low-pass filter is one which does not affect low frequencies and rejects high frequencies. The function giving the gain of a filter at every frequency is called the amplitude response (or magnitude frequency response). The amplitude response of the ideal lowpass filter is shown in Fig.1.1. Its gain is 1 in the passband, which spans frequencies from 0 Hz to the cut-off frequency Hz, and its gain is 0 in the stopband (all frequencies above ). The output spectrum is obtained by multiplying the input spectrum by the amplitude response of the filter. In this way, signal components are eliminated (``stopped'') at all frequencies above the cut-off frequency, while lower-frequency components are ``passed'' unchanged to the output. where is the filter input amplitude at time (or sample) , and is the output amplitude at time . The signal flow graph (or simulation diagram) for this little filter is given in Fig.1.2. The symbol `` '' means a delay of one sample, i.e., . Figure 1.2: System diagram for the filter . where is the sampling interval in seconds. It is customary in digital signal processing to omit (set it to 1), but anytime you see an you can translate to seconds by thinking . Be careful with integer expressions, however, such as , which would be seconds, not . Further discussion of signal representation and notation appears in §A.1. Figure: Implementation of the simple low-pass filter of Eq. (1.1) in the C programming language. In this implementation, the first instance of is provided as the procedure argument xm1. That way, both and can have the same array bounds ( ). For convenience, the value of xm1 appropriate for the next call to simplp is returned as the procedure's value. We may call xm1 the filter's state. It is the current ``memory'' of the filter upon calling simplp. Since this filter has only one sample of state, it is a first order filter. When a filter is applied to successive blocks of a signal, it is necessary to save the filter state after processing each block. The filter state after processing block is then the starting state for block . Figure 1.4 illustrates a simple main program which calls simplp. The length 10 input signal x is processed in two blocks of length 5. You might suspect that since Eq. (1.1) is the simplest possible low-pass filter, it is also somehow the worst possible low-pass filter. How bad is it? In what sense is it bad? How do we even know it is a low-pass at all? The answers to these and related questions will become apparent when we find the frequency response of this filter. Think of the filter expressed by Eq. (1.1) as a ``black box'' as depicted in Fig.1.5. We want to know the effect of this black box on the spectrum of , where represents the entire input signal (see §A.1). Suppose we test the filter at each frequency separately. This is called sine-wave analysis.2.1Fig.1.6 shows an example of an input-output pair, for the filter of Eq. (1.1), at the frequency Hz, where denotes the sampling rate. (The continuous-time waveform has been drawn through the samples for clarity.) Figure 1.6a shows the input signal, and Fig.1.6b shows the output signal. Figure 1.6: Input and output signals for the filter . (a) Input sinusoid at amplitude , frequency , and phase . (b) Output sinusoid at amplitude , frequency , and phase . The ratio of the peak output amplitude to the peak input amplitude is the filter gain at this frequency. From Fig.1.6 we find that the gain is about 1.414 at the frequency . We may also say the amplitude response is 1.414 at . The phase of the output signal minus the phase of the input signal is the phase response of the filter at this frequency. Figure 1.6 shows that the filter of Eq. (1.1) has a phase response equal to (minus one-eighth of a cycle) at the frequency . Continuing in this way, we can input a sinusoid at each frequency (from 0 to Hz), examine the input and output waveforms as in Fig.1.6, and record on a graph the peak-amplitude ratio (gain) and phase shift for each frequency. The resultant pair of plots, shown in Fig.1.7, is called the frequency response. Note that Fig.1.6 specifies the middle point of each graph in Fig.1.7. Not every black box has a frequency response, however. What good is a pair of graphs such as shown in Fig.1.7 if, for all input sinusoids, the output is 60 Hz hum? What if the output is not even a sinusoid? We will learn in Chapter 4 that the sine-wave analysis procedure for measuring frequency response is meaningful only if the filter is linear and time-invariant (LTI). Linearity means that the output due to a sum of input signals equals the sum of outputs due to each signal alone. Time-invariance means that the filter does not change over time. We will elaborate on these technical terms and their implications later. For now, just remember that LTI filters are guaranteed to produce a sinusoid in response to a sinusoid--and at the same frequency. Figure 1.7: Frequency response for the filter . (a) Amplitude response. (b) Phase response. The above method of finding the frequency response involves physically measuring the amplitude and phase response for input sinusoids of every frequency. While this basic idea may be practical for a real black box at a selected set of frequencies, it is hardly useful for filter design. Ideally, we wish to arrive at a mathematical formula for the frequency response of the filter given by Eq. (1.1). There are several ways of doing this. The first we consider is exactly analogous to the sine-wave analysis procedure given above. Assuming Eq. (1.1) to be a linear time-invariant filter specification (which it is), let's take a few points in the frequency response by analytically ``plugging in'' sinusoids at a few different frequencies. 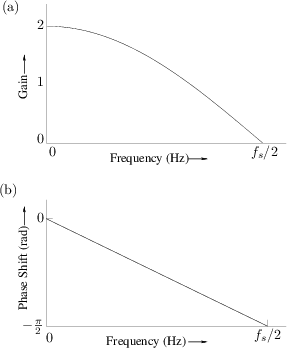 Two graphs are required to fully represent the frequency response: the amplitude response (gain versus frequency) and phase response (phase shift versus frequency). The frequency 0 Hz (often called dc, for direct current) is always comparatively easy to handle when we analyze a filter. Since plugging in a sinusoid means setting , by setting , we obtain for all . The input signal, then, is the same number over and over again for each sample. It should be clear that the filter output will be for all . 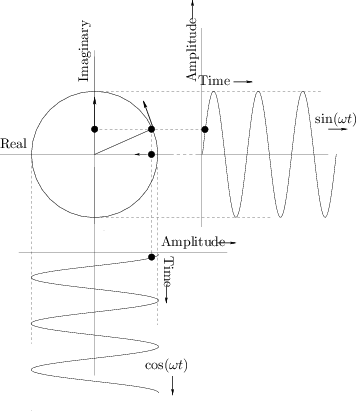 Thus, the gain at frequency is 2, which we get by dividing , the output amplitude, by , the input amplitude. Phase has no effect at Hz because it merely shifts a constant function to the left or right. In cases such as this, where the phase response may be arbitrarily defined, we choose a value which preserves continuity. This means we must analyze at frequencies in a neighborhood of the arbitrary point and take a limit. We will compute the phase response at dc later, using different techniques. It is worth noting, however, that at 0 Hz, the phase of every real2.2 linear time-invariant system is either 0 or , with the phase corresponding to a sign change. The phase of a complex filter at dc may of course take on any value in . The filter of Eq. (1.1) thus has a gain of 0 at . Again the phase is not measurable, since the output signal is identically zero. We will again need to extrapolate the phase response from surrounding frequencies (which will be done in §7.6.1). If we back off a bit, the above results for the amplitude response are obvious without any calculations. The filter is equivalent (except for a factor of 2) to a simple two-point average, . Averaging adjacent samples in a signal is intuitively a low-pass filter because at low frequencies the sample amplitudes change slowly, so that the average of two neighboring samples is very close to either sample, while at high frequencies the adjacent samples tend to have opposite sign and to cancel out when added. 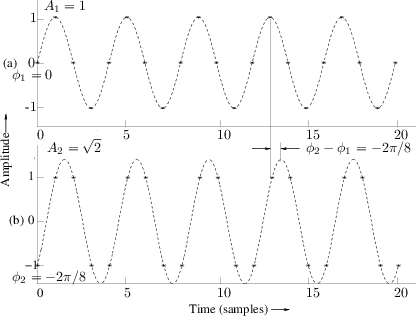 The two extremes are frequency 0 Hz, at which the averaging has no effect, and half the sampling rate where the samples alternate in sign and exactly add to 0. We are beginning to see that Eq. (1.1) may be a low-pass filter after all, since we found a boost of about 6 dB at the lowest frequency and a null at the highest frequency. (A gain of 2 may be expressed in decibels as dB, and a null or notch is another term for a gain of 0 at a single frequency.) Of course, we tried only two out of an infinite number of possible frequencies. All that remains is to reduce the above expression to a single sinusoid with some frequency-dependent amplitude and phase. We do this first by using standard trigonometric identities  in order to avoid introducing complex numbers. 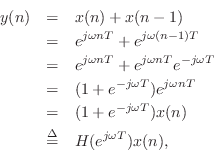 Next, a much ``easier'' derivation using complex numbers will be given. Note that a sum of sinusoids at the same frequency, but possibly different phase and amplitude, can always be expressed as a single sinusoid at that frequency with some resultant phase and amplitude. While we find this result by direct derivation in working out our simple example, the general case is derived in §A.3 for completeness. Thus, the gain versus frequency is and the change in phase at each frequency is given by radians. These functions are shown in Fig.1.7. With these functions at our disposal, we can predict the filter output for any sinusoidal input. Since, by Fourier theory , every signal can be represented as a sum of sinusoids, we've also solved the more general problem of predicting the output given any input signal. where is the imaginary unit for complex numbers, and is a transcendental constant approximately equal to . 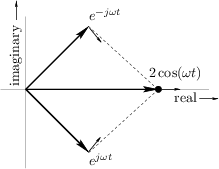 Euler's identity is fully derived in ; here we will simply use it ``on faith.'' It can be proved by computing the Taylor series expansion of each side of Eq. (1.8) and showing equality term by term [84,14]. Thus, sine and cosine may each be regarded as a combination of two complex sinusoids. Another reason for the success of the complex sinusoid is that we will be concerned only with real linear operations on signals. This means that in Eq. (1.8) will never be multiplied by or raised to a power by a linear filter with real coefficients. Therefore, the real and imaginary parts of that equation are actually treated independently. Thus, we can feed a complex sinusoid into a filter, and the real part of the output will be the cosine response and the imaginary part of the output will be the sine response. For the student new to analysis using complex variables, natural questions at this point include ``Why ?, Where did the imaginary exponent come from? Are imaginary exponents legal?'' and so on. These questions are fully answered in  and elsewhere [53,14]. Here, we will look only at some intuitive connections between complex sinusoids and the more familiar real sinusoids. which is naturally thought of as the complex amplitude of the complex sinusoid defined by the left-hand side of either Eq. (1.9) or Eq. (1.10). The complex amplitude is the same whether we are talking about the continuous-time sinusoid or the discrete-time sinusoid . and is the associated phasor in each case. Thus, we say that the phasor representation of is . Phasor analysis is often used to analyze linear time-invariant systems such as analog electrical circuits. Figure 1.8 shows Euler's relation graphically as it applies to sinusoids. A point traveling with uniform velocity around a circle with radius 1 may be represented by in the complex plane, where is time and is the number of revolutions per second. The projection of this motion onto the horizontal (real) axis is , and the projection onto the vertical (imaginary) axis is . For discrete-time circular motion, replace by to get which may be interpreted as a point which jumps an arc length radians along the circle each sampling instant. Figure: Relation of uniform circular motion to sinusoidal motion via Euler's identity (Eq. (1.8)). The projection of onto the real axis is , and its projection onto the imaginary axis is . Figure 1.9: Opposite circular motions add to give real sinusoidal motion, . This statement is a graphical or geometric interpretation of Eq. (1.11). A similar derivation (subtracting instead of adding) gives the sine identity Eq. (1.12). We call a positive-frequency sinusoidal component when , and is the corresponding negative-frequency component. Note that both sine and cosine signals have equal-amplitude positive- and negative-frequency components (see also [84,53]). This happens to be true of every real signal (i.e., non-complex). To see this, recall that every signal can be represented as a sum of complex sinusoids at various frequencies (its Fourier expansion). For the signal to be real, every positive-frequency complex sinusoid must be summed with a negative-frequency sinusoid of equal amplitude. In other words, any counterclockwise circular motion must be matched by an equal and opposite clockwise circular motion in order that the imaginary parts always cancel to yield a real signal (see Fig.1.9). Thus, a real signal always has a magnitude spectrum which is symmetric about 0 Hz. Fourier symmetries such as this are developed more completely in . Again, because of time-invariance, the frequency response will not depend on , so let . Similarly, owing to linearity, we may normalize to 1. By virtue of Euler's relation Eq. (1.8) and the linearity of the filter, setting the input to is physically equivalent to putting into one copy of the filter and into a separate copy of the same filter. The signal path where the cosine goes in is the real part of the signal, and the other signal path is simply called the imaginary part. Thus, a complex signal in real life is implemented as two real signals processed in parallel; in particular, a complex sinusoid is implemented as two real sinusoids, side by side, one-quarter cycle out of phase. When the filter itself is real, two copies of it suffice to process a complex signal. If the filter is complex, we must implement complex multiplies between the complex signal samples and filter coefficients. which is the phase response. There is a trick we can call ``balancing the exponents,'' which will work nicely for the simple low-pass of Eq. (1.1). We have derived again the graph of Fig.1.7, which shows the complete frequency response of Eq. (1.1). The gain of the simplest low-pass filter varies, as cosine varies, from 2 to 0 as the frequency of an input sinusoid goes from 0 to half the sampling rate. In other words, the amplitude response of Eq. (1.1) goes sinusoidally from 2 to 0 as goes from 0 to . It does seem somewhat reasonable to consider it a low-pass, and it is a poor one in the sense that it is hard to see which frequency should be called the cut-off frequency. We see that the spectral ``roll-off'' is very slow, as low-pass filters go, and this is what we pay for the extreme simplicity of Eq. (1.1). The phase response is linear in frequency, which gives rise to a constant time delay irrespective of the signal frequency. Mathematically, a sinusoid has no beginning and no end, so there really are no start-up transients in the theoretical setting. However, in practice, we must approximate eternal sinusoids with finite-time sinusoids whose starting time was so long ago that the filter output is essentially the same as if the input had been applied forever. This chapter has introduced many of the concepts associated with digital filters, such as signal representations, filter representations, difference equations, signal flow graphs, software implementations, sine-wave analysis (real and complex), frequency response, amplitude response, phase response, and other related topics. We used a simple filter example to motivate the need for more advanced methods to analyze digital filters of arbitrary complexity. We found even in the simple example of Eq. (1.1) that complex variables are much more compact and convenient for representing signals and analyzing filters than are trigonometric techniques. We employ a complex sinusoid having three parameters: amplitude, phase, and frequency, and when we put a complex sinusoid into any linear time-invariant digital filter, the filter behaves as a simple complex gain , where the magnitude and phase are the amplitude response and phase response, respectively, of the filter.